Competition Induction Designs – CID Heads is owned by John Konstandinou. It is the culmination of over two decades of experience manufacturing cylinder heads and intake manifolds that started with the founding of CHI Cylinder Heads in the late 1990’s out of Melbourne Australia. 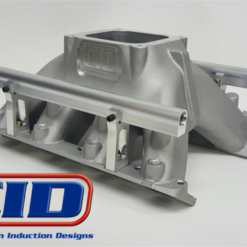 It all began with the designing and manufacturing the CHI Australian Hemi 6 cylinder alloy cylinder head that we were using in our drag race LJ 2 door Torana and progressed to the world renowned CHI 3V Cleveland Cylinder heads and intake manifolds. During the years I owned CHI, the 3V Cleveland heads and intake manifolds became the winningest brand of cylinder head and intake at the Engine Masters Competitions, going on to win no less than 5 Engine masters Competitions. Life took a turn in the late 2000’s that saw me selling CHI in 2009 before moving to the USA. After staying out of the automotive game for a couple years, the urge to get involved again became stronger, and in 2012 I registered www.cidheads.com and decided to make some new products. As of 2016 Competition Induction Designs will be a joint venture with Michael Konstandinou of ICE Ignition, along with the same talented group of industry leaders that helped make the CHI products the resounding success that they are. The many relationships that we have established over the years will continue to play a pivotal role, and have already spawned the Tony Bischoff inspired BE – LS7 manifold and the new GEN V LT1 cylinder heads that is a collaboration with Darin Morgan, and there are more in the works, so stay tuned. The BB Chevy head was actually started during the CHI years and is manufactured in Australia. All our new products are now 100% CAD modelled and manufactured in the USA, with all new pattern equipment produced in a foundry that specializes in Aerospace products. Whilst a skilled pattern maker can produce excellent results as witnessed with the CHI products, they are becoming a rare bread, and computer modelling allows for tighter control of the finished casting process, but most importantly allows us to produce as cast parts that approach CNC ported consistency. All our heads will feature CNC chambers and CNC throat blending for consistent air flow results. We will still offer CNC ported heads, and best of all the new tight casting control process, will allow us to reduce machine time and cut down on the cost of heads that we do offer CNC ported. As a former and current enthusiastic drag race fans, we take pride in bringing to market products that make previously unheard of HP levels affordable to the masses. Evidence of that can be seen in our new BE – LS7 intake manifold. How many as cast small block intake manifolds can lay claim to making 1100HP from a cast manifold, that doesn’t require any welding, yet is versatile enough to work on a 650HP engine in its as cast original state? Please take the time to look at our BE-LS7 and LS3 intake manifolds, our BE SB Ford Manifolds, Symmetrical Port Big Block Chevy Heads and matching intake manifolds as well as our Gen V LT1 cylinder heads, and come back soon to see more new products. Fore those that are interested, the BE-LS and BE Ford intake manifolds, the Gen V LT1 – BE LS7 cylinder heads are manufactured in Ohio USA, whilst the CID BB Chevy heads and intake manifolds are manufactured in Australia by the same foundry that produced the CHI products.